Shirts With Random Triangles: Tennessee freshman RB Jeremy Lewis to reportedly transfer. Lewis had had only six carries during the 2016 season. Tennessee has had a number of losses on the offensive side this season. 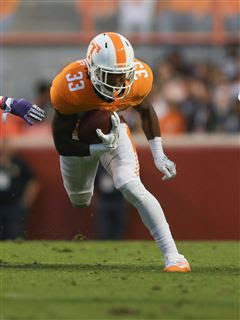 The most notable departure was that of RB Jalen Hurd, whose transfer plans were announced on October 31. two days after the Vols' lost to South Carolina. Tennessee next hosts Missouri on Nov. 19.